Clean every area of your boat -from port to starboard- with just one product! Marine 31 Port to Starboard All Purpose Cleaner takes out what daily boat life puts in -stains, mildew, black streaks and more! Developed by nautical enthusiasts in south Florida, Marine 31 Port to Starboard All Purpose Cleaner cleans exceptionally well while protecting the delicate marine environment. Marine 31 Port to Starboard All Purpose Cleaner is completely biodegradable and extremely effective. Eliminate the need for multiple cleaners. Marine 31 Port to Starboard All Purpose Cleaner is effective on black streaks, mildew, salt stains, drink spills, oil run-off, and more. It works on fabric, vinyl, fiberglass, upholstery, inflatable boats, life vests, boat covers, decks, canvas and more. 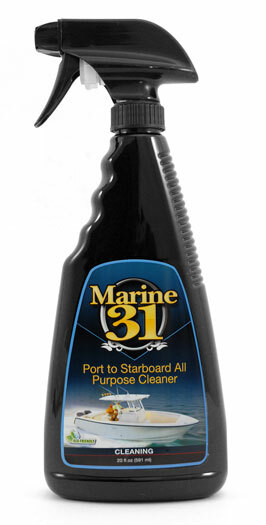 When it comes to Marine 31 Port to Starboard All Purpose Cleaner, more is the relative word! It cleans more, and because it is highly concentrated, it does so with less! Marine 31 Port to Starboard Cleaner, like all cleaners and protectants in the Marine 31 range, is fully biodegradable and eco-friendly. Dilute this amazing cleaner to your needs and make almost any surface on your boat clean and fresh. A Tip From The Captain�s Chair: Port to Starboard All Purpose Cleaner was designed to clean almost every occurrence on your boat, from stains to soda spills, without having a negative impact on the environment. There are no harmful acid or butyl ethers so you don't have to worry as you clean.